Grew up… in France, with his mother. His father was a Japanese businessman, but since his parents never married, his father returned to Japan while his mother stayed in France. His mother’s health was poor throughout his childhood, so Tamaki stayed by her side, refusing to have fun without her. Living… in Japan. At age 14, Tamaki moved to be with his father’s family. But his grandmother doesn’t like him, so he lives in the second Suoh estate, away from the rest of the family. Profession… student, host, and potential future heir to the Suoh business empire. 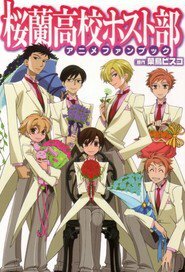 Tamaki is the president and founder of Ouran High's Host Club, which he describes as, "Ouran academy's elegant playground for the super rich and beautiful.” The Host Club entertains young women with flirting and pleasant conversation. Interests… besides running the Host Club, which takes up most of his time, Tamaki is also a high-achieving student and an accomplished piano player. He also has a strong leg in soccer, although he’s unable to aim effectively. Relationship Status… single. That’s because he’s completely oblivious to the fact that he’s in love with Haruhi, the only girl in the Host Club. Everyone else knows, but Tamaki prefers to think of himself as a father figure, a mentor of sorts. Personality… expressive, flamboyant, and often silly. Tamaki can easily come off as a shallow person obsessed with style and beauty. But that conceals an intelligent, insightful person whose main concern is for others. That doesn't mean he has to be serious about it, though! Tamaki Suoh's popularity ranking on CharacTour is #831 out of 5,000+ characters. See our top-ranked characters and read their profiles.